Welcome to RELIANT, the Reliant website that is called just that (reliant.website) and is the official web site for the Reliant Motor Club. 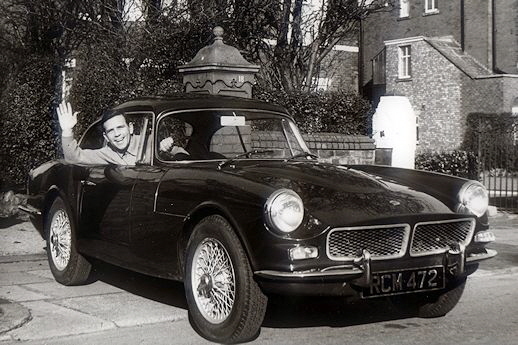 The RMC is a club for Reliant enthusiasts that offers members not only the usual benefits of club memberships but also access to the largest on-line Reliant archive in the world. Each year, members also receive 4 newsletters and 2 information packed magazines delivered straight into their e-mail Inbox so that they can be enjoyed across multiple electronic platforms and on the go.The RMC was founded in June 2016 by Elvis Payne and Mark Cropper whose combined personal Reliant archives contain over 2,500 items including photographs, plans, brochures, factory documents, press releases, Reliant newspapers, handbooks and much more. The archives mainly consist of paper based items although they do also include a few rare items such as Reliant Founder Tom Williams’ personal set of wood chisels and the original bronze Reliant sign from the old Reliant building in Tamworh, Staffs. An ongoing resource to build up a catalog (and indeed collection) of every Reliant brochure issued for all models from 1935 - 2002. The RMC Reliant brochure catalog is the largest on-line collection of Reliant brochures. 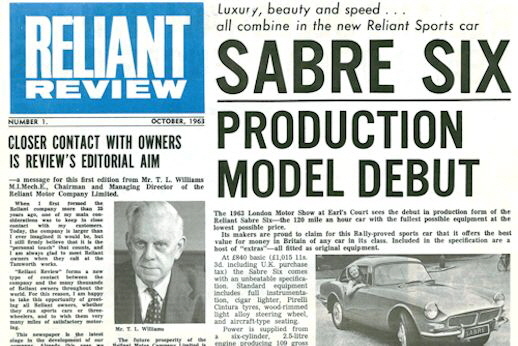 From 1963 to 1977 Reliant issued its own newspaper which offers an invaluable insight into Reliant during those years. 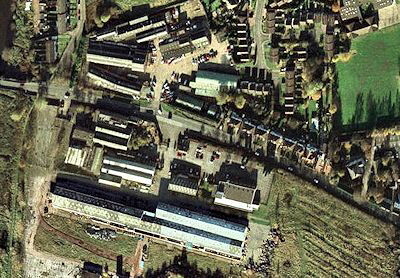 The name was then revived in 1997 - 1998 for an internal newsletter. For the first time every copy is now available on-line. All 96 copies available to read. 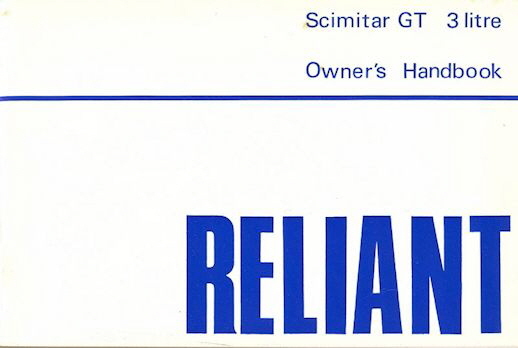 An ongoing collection to build up a catalog of every handbook that was issued by Reliant with their vehicles. Handbooks will continue to be added as they become available and get scanned. 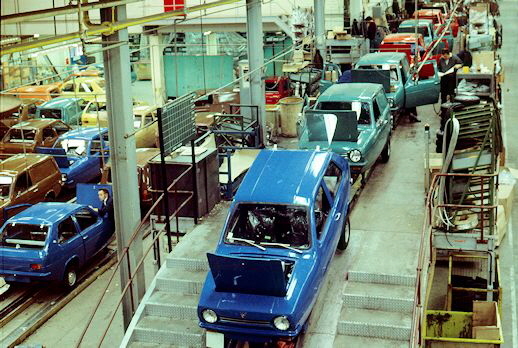 An ongoing collection to build up a Library of miscellaneous Reliant documents from all areas of Reliant (Employees, Dealers and Customers) that includes Press Releases, Notices, Letters, Building Plans and News items etc. An ongoing collection to build up a catalog of as many Price List as we can that were issued by Reliant for all of its models. Price List will continue to be added as they become available and get scanned. 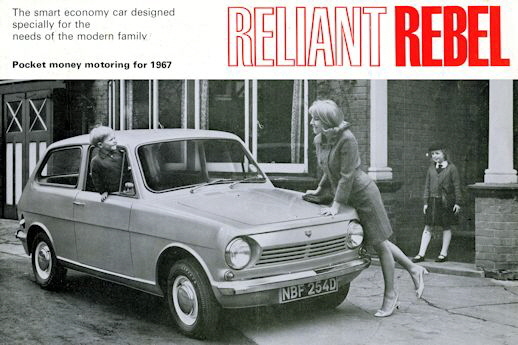 The RMC has sought permission to bring you this collection of Reliant related articles from various magazines over the years. Articles will continue to be added as they become available. View past and present club magazines and newsletters issued by the RMC. The RMC issues 2 magazines a year and 4 newsletters a year. 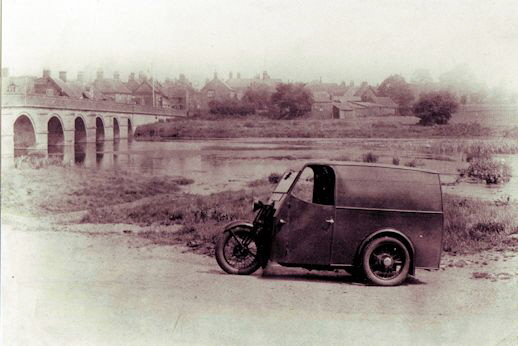 A small selection of just some of the hundreds of period photographs from the Reliant Motor Club Archives. Our on-line Sign up is quick and safe which means you can be a member almost straight away. RMC Members enjoy discounts at Fertan Products (15% off), Northern Radiators Ltd (10% off), Big Dug Ltd (10% off), classicline insurance (10% off),James Mann (£4 off How to photograph cars book), Car Wash Co (10% off), Rajah Ayurveda, India (20% off). Click for full details of discounts available as a RMC member. As part the Reliant Scimitar GTE’s 50th Anniversary in October 2018, the Reliant Motor Club teamed with with Tamworth Brewring Co. to unveil a new celebratory beer called Scimitar. 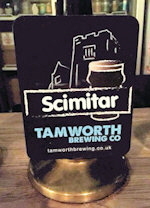 Brewed onsite in Tamworth, Scimitar was a one off ale created by George Greenaway, The RMC were at the launch to both celebrate the Scimitar’s anniversary and indeed to taste the new ale. 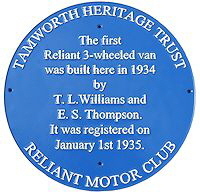 Ever since the Reliant Motor Club joned the Tamworth Heritage Trust in 2016, we have been working towards a blue plaque to be placed on the former home (named Bro-Dawel) of Reliant’s co-founder T.L.Williams in Tamworth. This was achieved in July 2017 when the RMC and THT were delighted to unveil a Reliant blue plaque at Bro-Dawel. We are delighted that Her Royal Highness The Princess Royal is an Honorary Member of the Reliant Motor Club. The Princess sends her best wishes to all within the club. Her Royal Highness has owned a number of Reliants including Scimitars, Robins and Kittens and still owns a 1989 Middlebridge Scimitar. The RMC is proud to be a member of the Tamworth Heritage Trust. The RMC is on DriveTribe with the Reliant Tribe. Come and join our tribe.